Newcastle United will look to heap the pressure on Andre Villas-Boas as his Chelsea side visit the newly named Sports Direct Arena on Saturday lunch time. The Magpies have suffered just one defeat all season and that was away to league leaders Man City, a run of form which sees them in the lofty position of 4th. They can consolidate their position with three points over a struggling Chelsea side who were knocked out of the Carling Cup midweek and have lost three out of their five league games. For the Blues, it's a matter of taking control and winning. Chelsea simply cannot afford any more defeats. Midfielder Cheik Tiote will be missing once again as he attempts to shake off a knee problem. The Ivory Coast international has been sidelined since the end of October, although manager Alan Pardew is confident he does not need surgery. Winger Jonas Gutierrez is suspended after being sent off at Manchester United last Saturday but striker Leon Best (groin) has returned to training and is available. As John Terry returns from suspension, Chelsea will be without Josh McEachran. The midfielder was forced from the field in Tuesday's Carling Cup defeat to Liverpool with an injury to his left ankle, which he is expected to recover from in less than a fortnight. 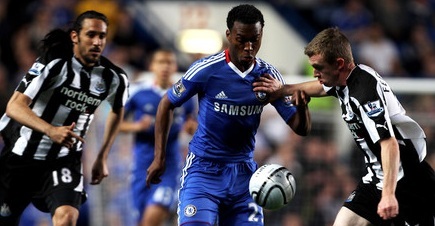 Long-term knee injury victim Michael Essien is the only other absentee. Newcastle have won none of the last eight Premier League meetings with Chelsea (D4 L4). The Magpies have scored just three goals in their last six home games against Chelsea and failed to score in three of the last four. Newcastle are unbeaten in their last 10 Premier League home games (W6 D4). Chelsea have won three and lost four of their last eight Premier League away games. This is Newcastle’s best start to a season since 1996-97 when they had 28 points after 13 matches. The Magpies have kept just one clean sheet in their last nine Premier League matches. Alan Pardew’s side have suffered just one defeat in their last 16 Premier League games (W8 D7 L1). Chelsea are the only team of the top seven to take no points from head to head games against the other teams in that group this season.